With our shared and reseller hosting under CloudLinux, we offer the ability to change the PHP version. In some specific cases you may need to change PHP version in your web hosting account at WebHostingBuzz. We have implemented a server setup model that allows each customer to choose which version of PHP to use. 3. In this case, the default PHP version for this server is 5.3.26 (PHP 5.3). 2. If you scroll down, you’ll see a box titled ‘Software/Services’. 3. 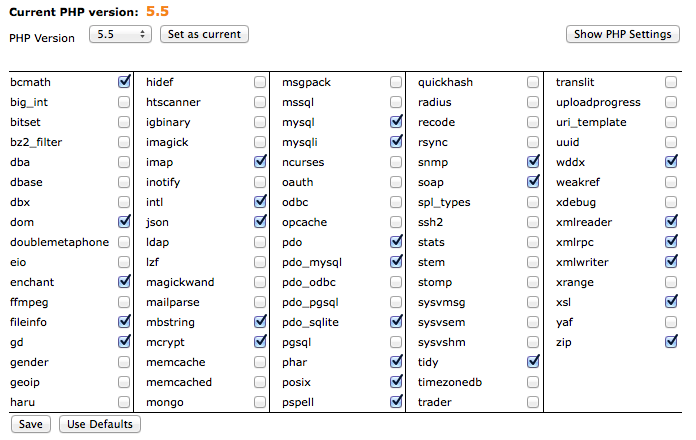 Click on ‘Select PHP Version’, you’ll then see the below list of options. If you’re happy with your PHP version, but wish to turn individual extensions on/off, you can do this by ticking/unticking the various extensions. 4. If you click on the PHP Version drop-down box, you’ll be able to select from a number of versions (in this case, PHP 4.4 – 5.5). Please note, the ‘native’ PHP option does not allow you to change any options. 5. 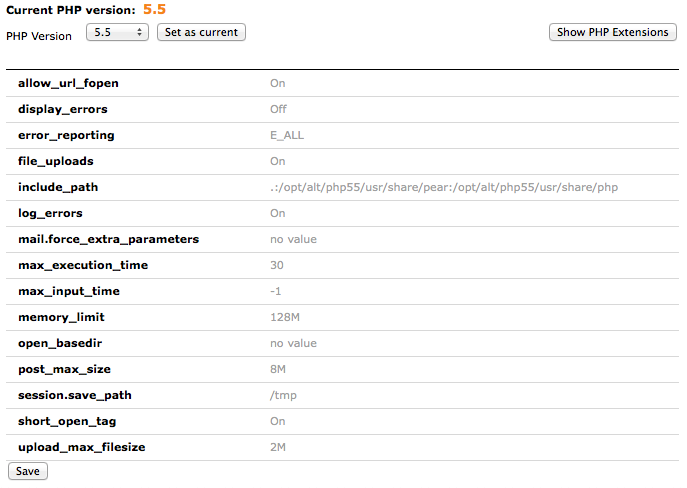 If you wish to change individual settings within the PHP version, you can click ‘Show PHP Settings’. 6. By clicking on one of the options (in grey), you will be presented with a drop-down list through which you can change individual settings. 7. Once done, you can click Save. Please do not upload/use custom php.ini files. If you’re stuck with some really old web software and can’t upgrade for some reasons, or if you want to try the latest beta versions of PHP – it’s still possible with WebHostingBuzz. Go ahead and get a virtual private server starting at $14.95/month, or a dedicated server starting at only $139/month! 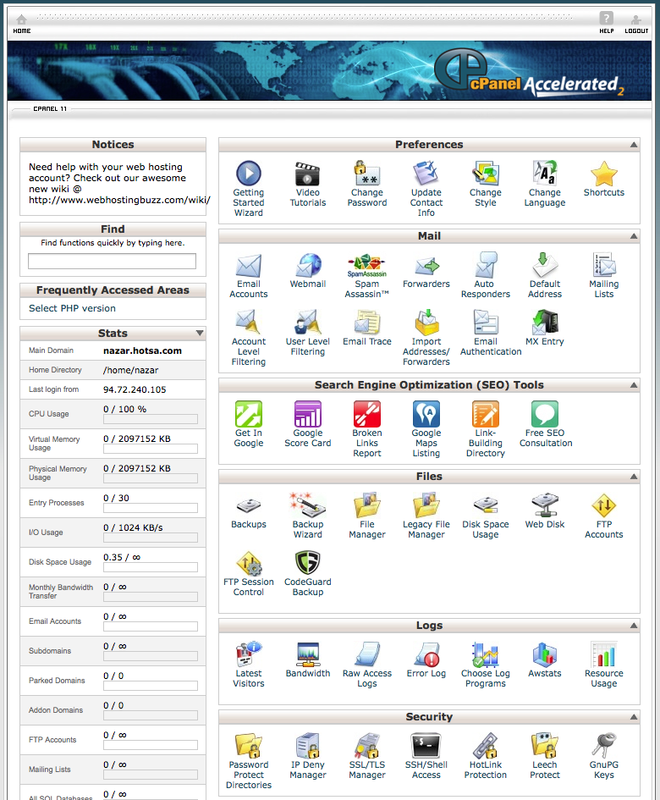 With unrestricted root access you’ll be able to install and configure any server-side software needed. We highly recommend to use PHP 5.4.x branch and adapt your scripts accordingly. PHP 5.3.x is now EOL (End Of Life), so we would no longer recommend using that version. If you’re using a ready-made PHP-based software (CMS, forum, shopping cart, etc) – be sure it’s up to date. In case the latest version of your software doesn’t support PHP 5.4.x – contact your software vendor for a new version or PHP 5.4 compatibility patch. If all your web scripts support PHP 5.4 just fine but the default PHP version in your account is earlier than 5.4 – go ahead and use the above instructions to change PHP version to 5.4.x. Share the post "PHP Selector"